I read a fair number of beer blogs, and pick up beer magazines when they're laying around free, and now I've gone and subscribed to Beer Advocate magazine -- more as a way to support beeradvocate.com than as a cover-to-cover read. But the frontier I haven't really crossed is beer multimedia. Podcasts, youtube/vimeo clips, and the latest spate of beer-related movies and TV shows -- I rarely watch or listen to them. The reason is simple: in the time it takes to listen to one podcast or watch one video, I can scan hundreds of blog headlines, and read my fill of interesting articles. And even when a blog I read inserts a video interview, I almost never watch it. What are your thoughts on beer audio or beer video? Are there any podcasts that are so chock-full of goodness that you recommend watching or listening to every edition? What about videos on blogs -- do you click the "play" button, or do you skip over them? Do you follow any of these regularly? About half of these I only know about because I'm friends with the people involved. Are there any important beer podcasts out there that I should be aware of? Don't tell me about the really stupid ones, I'm sure there are thousands of those. I've had it in mind to pose this as a "your thoughts" question for awhile, but it was reading Jeff's article about the Beer West/Digimarc partnership that got me stewing about it again. If your smartphone can get useful information out of a magazine, that makes sense to me. But if it just leads you to hours of low-information video, it doesn't seem very useful. Anyway, fire away with your comments. I don't and it's largely for the reason you said; I can scan through/read a lot faster. Plus, I tend to do a lot of my reading on the subject at work and they tend to frown upon video, mostly because they'll know that I'm doing it. Reading is silent. I listen to Beer O' Clock every week. You just don't get the effect of a Don Younger or Carl Singmaster interview in print media. I do not listen to any podcasts or radio shows for 2 reasons. I don't have the time and I find them pretty boring. I usually don't watch videos on blogs. They are usually of inferior quality (except for Snob Ritch's of course!!!). But, if they include a particular brewer that I am friends with or fond of I will watch a little bit of it. Especially if they are humorous. That being said, I am all for audio, video, 3D holograms....whatever a blogger or media type feels they need to do to reach an audience. I am just one craft beer enthusiast. What I spend my time doing to stay abreast of the scene is not indicative of everyone else. Now excuse me as I work on my latest claymation video of a Portland Beer vs. Music cage match. Colin Meloy v. John Harris! James Mercer v. Ron Gansberg! Storm Large v. Lisa Morrison! There's some great stuff out there. But between life and my own blog, I don't have the time either. That said, I could be a fan if I found one that offered new info, or on the video side, was especially vivid. A grainy shot of a brewer standing in front of a conditioning tank and chatting for ten minutes is not riveting video. I shoot vids from time to time and I have a rule of thumb: no more than a couple minutes (three as an absolute max), and only if it's something interesting. My last video, of Alex and Gerritt making Oyster Stout at Upright, was short and had what I thought was interesting content. It has been viewed about 300 times, which is pretty good for those things. I do like Beer O'Clock but don't get to listen to it regularly. I guess I'm happy to confirm that I'm not the only abstainer out there, but this is also a self-selected group of people who read blogs already. Ritch, Jeff: I think you hit the nail on the head: the video has to offer something unique, like scenes from the hop harvest. What's weird to me is how many "watch us taste beer" podcasts are out there. BTW, Jeff, the Beer O'Clock link has archives of past shows. I try and catch up when I discover that Lisa had covered an interesting topic, and I would probably do more of that if the archives had track listings with start/stop times (hint, hint). I have a really tough time with podcasts and videocasts as well. I've watched Beer Tap TV and I like it. I definitely prefer their program The Buzz to the one where they are reviewing a beer. I don't really like to watch beer reviews, I want to read about it and/or do it myself. I actually most enjoy some of Ezra's video interviews on his blog. I used to watch the videos, but now what I do is let it play while I keep scanning things. I'm able to pay enough attention to make it worth it. But many videos I've seen aren't worth being back ground noise and not enjoyable to watch either. I discovered the Brewing Network podcasts in the last year or so and have started listening to them. There's quite a bit of backlog so I tend to pick and choose the episodes I'm most interested in. The other beer podcast I listen to on a regular basis is Getting Tanked With Frank. They cover beer news and is always good for a laugh. Though you'll probably want to listen with headphones if you're at work. 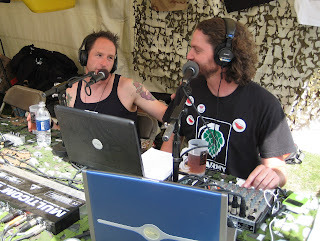 All right, two votes for Getting Tanked with Frank, one for BeerTapTV. Hmm, the BeerTapTV guys have a "Douche report" on their show, I wonder if socialretard knows about that. Gotta say, neither of them really grabbed me. Any other recommendations? I'm eagerly awaiting Jason's claymation efforts. I love listening to beercasts, you absorb allot more info that way. Hadn't heard of the Douche Report on Beer Tap TV, but I don't listen to beer podcasts. Your post gives me an idea, though. Bring The Beer Retard back by listening to and reviewing one episode of every beer podcast out there. I bet I'd get through 2-3 podcasts and that'd be the end of that.